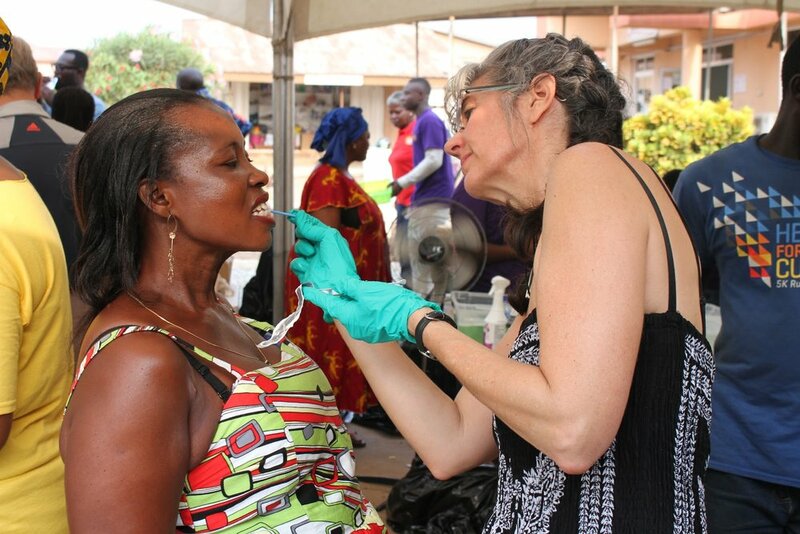 Co-Founder Kimberli Brackett has been making trips to Ghana for over a decade! She had pictures of Ghanaian children she has helped throughout this time that sparked the kids’ interest. We completed our first project with Prosperity Academy to give kids close to Lake Volta a chance to get educated. Lake Volta is the epicenter of child slave trafficking. Families in poverty feel forced to let their kids work for unfair wages and extremely harsh conditions. 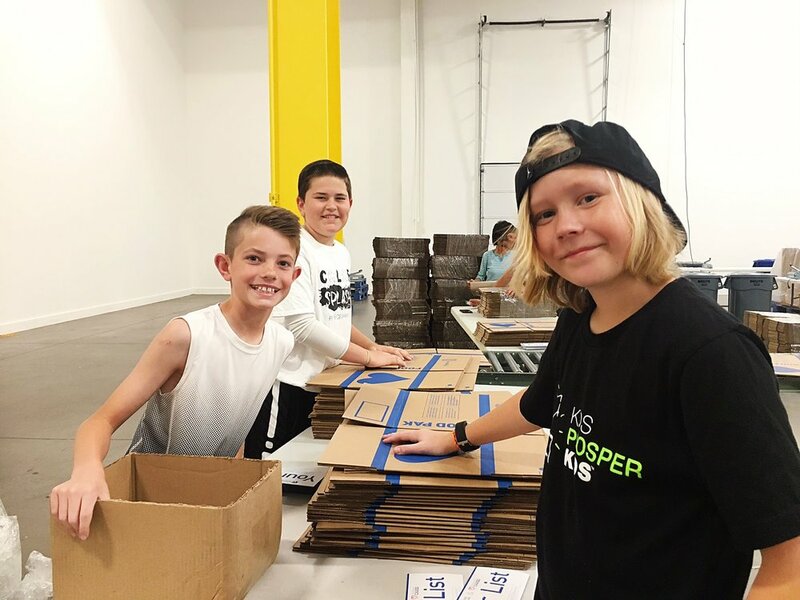 Hurricane Harvey hit in 2017 and Kids Prosper Kids decided to branch out into local efforts to reach out to Pt. Arthur schools, specifically Adams Elementary. We went down to donate blankets, books, and school supplies! Some of our key leaders in beginning this organization include the Dickerson family. This picture includes the people that visited our land in Ghana to help organize the plan. We are very grateful for Kevin and Angie Dickerson’s contributions to the organization. Phase 2 was completed the plans for the building and selected contractors in Ghana for work! Rather than building a normal school, our school will help train Ghanaian children in trades and businesses that will enable them to end the cycle of poverty. We also plan to give out microloans to these individuals once they are ready to start their business. We are constantly having kids run their own fundraising/donating operations to give 100% of their profits to Kids Prosper Kids. We wouldn’t have nearly enough space for all of their efforts, but we appreciate every last one of them. Follow us on social to see the latest! Kimberli shared her story about the Ghanaian kids to her 5th grade class, and they instantly discovered that because they have access to education in Prosper, TX, so should the kids in Ghana that are so vulnerable to modern day slavery. Mrs. Brackett’s 5th Grade Class pursued an expert in an attempt to make a bigger impact! They decided to form Kids Prosper Kids on January 29th, 2017. This non-profit is truly built upon the student advisory board in team with the amazing board of directors we have! We have branches of KPK across all schools in Prosper that meet monthly. We purchased 15 acres of land in Kumasi, Ghana in December of 2017. This was part of Phase 1 in our plan. We adopted a section of the highway to clean up as part of our local efforts. We regularly host sign ups to clean the road and do our part locally to help the planet! Nico Ray premiered his documentary about KPK on February 8th, 2019. It paints our picture throughout our journey and has helped to spread the message. Here, a group of members are at the Children’s Hunger Fund. Every month, KPK hosts service events for our members to give back to our community. It is important for our community to know that we are giving back to the less fortunate around us as well us abroad. Join us in our mission to give education to all children in Ghana while empowering the kids in Prosper to make a difference locally and abroad. You can even make us your Amazon Smile charity! Every time you make a purchase, Amazon donates some of the profits to us! With just a few clicks, your everyday purchases can make a difference: smile.amazon.com/ch/81-5174262. You can also shop our store at the top!